Although I like Google Calendar more than any calendar apps today, I cannot use it as my sole calendar app simply because I still have to deal with MS Outlook Calendar when I'm at the office or schedule some office related meetings and events. There is a little but handy app that can sync both your MS Outlook Calendar and Google Calendar. Google Calendar Sync works with Outlook 2003/2007 on Windows XP and Windows Vista. It has an option to modify the sync flow, whether you like it to be 1-way or 2-way synchronization. 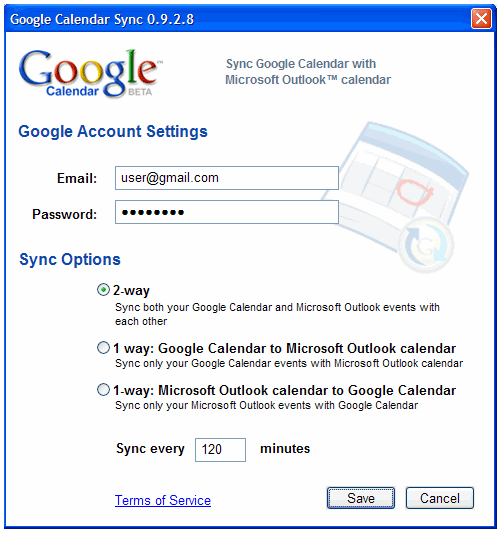 To use Google Calendar Sync, follow these steps. 1. Enter your Google Calendar account details. 2. Select Sync Option you want the app to use. 3. Set the Sync interval then click Save. 4. Google Calendar Sync will on the background and you can access the settings with a right click on its system tray icon.